You will be amazed by the minimalist charm that the Cap Chrome Stool White brings to a room. Cleverly compact and showcasing clean and crisp style, the Cap Chrome Stool excels in every way, ensuring comfort whilst occupying little visual space. Covered in cool white faux leather, the seat is padded for your comfort and possesses a low space saving backrest for additional support. Descending to the floor beneath is a single column frame finished with contemporary mirrored chrome. This includes a gas lift mechanism, so you can adjust the height to suit your requirements, as well as 360-degree swivel movement and a stylish half-moon footrest. A rounded base keeps the Cap stable, with a rubber underside to help prevent damage to your floor. 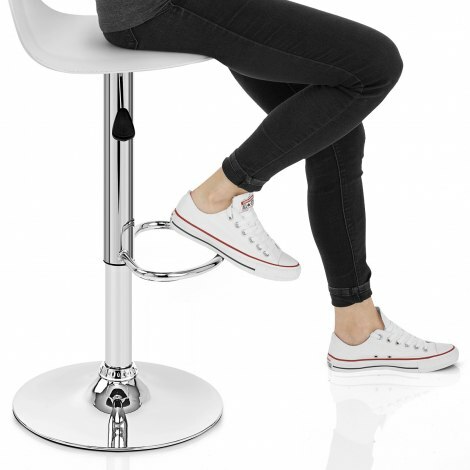 "These were great value, really fast delivery"
Found bar stools a third of the price of elselwhere so ordered but was sceptical. However the quality and service were that good I can hardly believe it. Great quality product and efficient hassle free payment and delivery. Will definitely return...this company is a breath of fresh air. What a find! This company were a delight to deal with. I initially called them and they were so helpful. I also went to visit the showroom in Birmingham. Once again, lovely people to deal with. Thank you for a great service. Bought a few stools previously, as they were of such good quality and great price decided to get some more. Ordered very easily from the website and had them the next day. Unfortunately, one of the seats was slightly damaged. Informed Atlantic, they despatched a replacement the following day. No quibbles. The customer service team was brilliant and with the speed of service and delivery would definitely order products from the company again. Good pricing,speedy deliveries and great customer care. Looks good. I bought as a present for my son in law who seems pleased with it. These were great value, really fast delivery. Easy to put together. Love them.